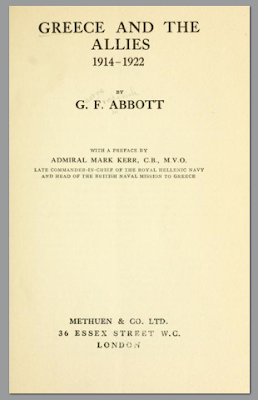 "Greece and the Allies 1914-1922"
or malice, render the publication of this book particularly opportune. M. Venizelos and King Constantine. colony next to an hereditary enemy like the Turk. civilians, M. Venizelos and the Allied Ministers. official originals, to prove the case. welfare of the British Empire at heart. conclusion of peace by the defeat of Greece and the defection of France. and every known artifice for manipulating public opinion. passion, retained their respect for facts. "and I cannot find in it a single word which justifies suppression. vital interests of the British Empire.